What are you struggling with today that requires you to access your inner reserves of strength? Today’s card refers not to physical strength, but to will-power and self-control. It may be a commitment you’ve made to yourself not to cave in or to compromise your principles. And it could be a situation in which you’re struggling to uphold your part of a bargain. Dieting for example, or giving up smoking or drinking. Refusing to react or allow your buttons to be pushed. The strength card can also refer to finding an appropriate outlet for something that you may have responded to in a less than positive manner in the past. Whatever it is, know that this card encourages you to stay on course and not fall back into unhealthy reactions or patterns. The woman in this version of the card sits atop what looks like a two-headed beast. There’s a fierce Lion head (and hind-quarters) and gentle Unicorn head (and front-quarters) and a lily at tip of the beast’s tail. She’s lost in thought on the his back, an infinity symbol hovering over her own head like a halo. The imagery in this card speaks of both taming the inner beast — i.e., passions and desires — but also getting in touch with the inner “magic” — i.e., intuition, inspiration and creative self-expression, and not giving any more power to one of them over the other. As the Sun moves into Taurus today, it’s important to work on harnessing your emotions and acting with purpose and intent. You don’t want to deprive yourself of feelings of joy or happiness, but you do want to get a handle on some of the more self-defeating emotional responses. This is the message behind the Strength card. Like the woman on the back of the beast, you want to maintain your composure and give just as much weight to the calmer, gentler aspects of your being as you do your more fiery and passionate drives. 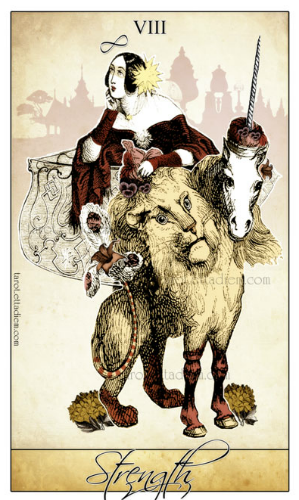 Today’s tarotscope — Strength — featuring the Isidore Tarot by Bethalynne Bajema, based on black and white illustrations by artist J.J. Grandville. Used by generous permission. For more information on this beautiful deck, click here. Please also check out the Attic Shoppe Trading Company website and please also check out the Pinterest, Tumblr and Twitter pages too!